Very few know that the godfather of baseball is a Romanian traditional sport named Oina / Oină. In 1896, when the modern Olympics were first held, Romania offered to send two teams to play this game, because it was not played in other countries. There's lots of uncertainty regarding the real history of oina, but you can read one interesting insight into Oina world, from beginnings to the present in Univ. Dr. Nicolae Postolache's book " Oina Fascination, The Game of the Romanians from all over the world / Fascinatia Oinei, jocul romanilor de pretutindeni" officialy launched in April 24, 2010 at the 4th edition of the Romanian Oina Supercup. Vlaicu Voda, named also Vladislav I, ruller of the principality of Wallachia between 1364-1377, was the man who spread it this game across Wallachia and organized the first "hoina" competitions. This game was mentioned in Alexandru Davila's (1888) historic drama "Vlaicu Voda" as being played during Vlaicu Voda reign and in Nicolae Iorga's book "Comments and problems from Banat / Observatii si probleme banatene" as being played in the Hateg church's courtyard in 1763 by the priest Nicolae Stoica. Anyhow, "Oina" game is a Romanian heritage, "oina" verb, aka "transhumance", means to take a herd of sheep down from the mountains to the field in Autumn. Many names used for various elements of this sport belong to the sheep breeding: “The Sheppard / Baci” is the captain of the team, “The bat / bata”, the player's arrival on the pitch is known as "Entering the sheep den / Intrare la strunga", player caught in the middle "player caught in the sheep's den / jucator la strunga", players who catch the ball "players who guard the sheeps / pascari". Oina is a sport that involves speed, accuracy, team work and sounds closer to cricket and baseball, having similarities with both. The basic rule is that there are two teams, with one of them batting and another catching. The game begins when the catching team throws the ball at a player from the batting team, who tries to hit the ball as far as he can with a wooden bat. Once he hits the ball, the batter must run the “back and forth lanes” before the catching team retrieves the ball. There can be a maximum of 2 players running each lane at the same time. A player can be hit in both lanes once. The weight of the ball used in oina is similar with the weight currently used in baseball, but is made from leather filled with animals hair and has 7-8 cm diameter. The teams in Oina have eleven on a side, while baseball has only nine. The "bat" in Oina is longer and slimmer and the defense can score by hitting the attacking players from the game. The Oina game is the shortest, takes only 30 minutes, while a baseball game takes about three hours, not quite as long as a game of cricket which can have a 3-5 days duration. The Oina pitch is a rectangle, 70m long by 32m wide divided into: "the in game / in joc" area, which is 60x32m ; "the batting zone / zona de bătaie" which is 5m long and delimited from the in game area by the batting line and "the back zone / zona de fund" which is a 5m long safe zone during a run - delimited from the in game area by the back line. The attacking side player that has commenced a run will have to cross the following four lines in order: "the start line / linia de plecare" (the left side of the batting line); "the arrival line / linia de sosire" (the left side of the back line); "the return line / culoar de ducere" (the right side of the back line) and "the escape line/ culoar de intoarcere" (the right side of the batting line). The in game area is further split into the advance and return triangles and squares. At the intersection of the lines inside the game area and the pitch limits or other lines within the game area, there are circles which determine the positions of "the midfielders / mijlocaşi" and "side players / mărginaşi". The 1m and 3m semicircles are used for batting and serving. A waiting line is drawn for attacking players to wait their turn to bat. Winning brings the team 3 points, a draw brings in 2 points, and the losing team will score 1 point. Quitting or elimination of the team will result in no points being awarded and a 0-9 loss. Running out of substitutes due to injuries will result in a 0-6 loss and 1 point being awarded, while if the same situation is due to the elimination of a player, the result will be a 0-9 loss and no points being awarded. 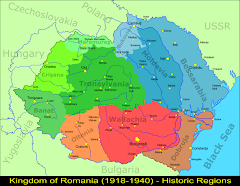 More datails about this game, rules, teams and Oina competitions in "The Romanian Oina Federation / Federatia Romana de Oina" and "Oina Association / Asociatia Oina" websites. I love history and I have read all about Vlad I his campaign of terror fighting the Turk and the legend that followed. This little insight makes him more human. But isn't also the American Indian have that claim? I am following you and invite you to visit my blog and if you like it maybe you will follow me.